Lake Erie has a long history of cultural eutrophication (excessive nutrient inputs), algal blooms and low oxygen levels. A widespread campaign in the 1970s to eliminate phosphorus from household detergents, fertilizers and other products resulted in a temporary improvement in ecosystem health during the 1980s. 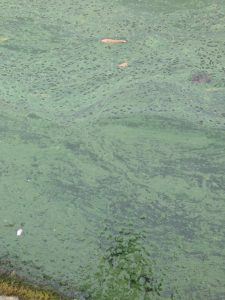 In recent decades, however, nutrient inputs in the form of soluble reactive phosphorus have re-emerged from several Ohio tributaries (Maumee, Sandusky and Cuyahoga rivers) and resulted in algal blooms and low oxygen conditions of increasing severity. Lake Erie often experiences rather large (~5,000 – 10,000 km2), seasonal low oxygen zones that are believed to displace fish from ideal habitats into nearby areas with higher oxygen that are often less desirable habitats. This displacement results in a change in diet and subsequent impacts upon growth and reproduction. In shifting to areas of higher oxygen, fish often find themselves clustered along low oxygen zones. This spatial clustering of fish has been hypothesized to increase their vulnerability to commercial fishing gears. For example, Lake Erie commercial fishermen have reported increased catch rates of Yellow Perch (Perca flavescens) in trap nets set along the margins of these low oxygen zones. A team of researchers lead by Richard Kraus from the US Geological Survey, Great Lakes Science Center, Lake Erie Biological Station sought to learn more about fish abundance and catchability (susceptibility to fishing) along Lake Erie low oxygen zones. Kraus and colleagues made use of oxygen and temperature data loggers placed along the bottom, temperature and dissolved oxygen water column profiles, as well as hydroacoustic technologies to determine oxygen levels in association with fish densities and vertical distributions. Data were collected near Fairport Harbour, Ohio during the months of August and September of 2011 – 2013. Demersal (bottom dwelling) species were caught more frequently in normoxic (normal oxygen zones) that neighbored hypoxic (low oxygen) zones. 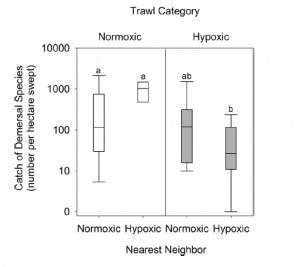 Lower catch rates were observed in normoxic zones that neighbored normoxic zones; as well as in hypoxic zones that were bordered by both normoxic and hypoxic zones. Reproduced from Kraus et al. (2015). Kraus and colleagues used commercial and survey data to compare fish distributions in normal oxygen zones versus low oxygen zones and determine if low oxygen had an impact on trap and trawl catch rates. They found that dissolved oxygen levels in Lake Erie had a tendency to fluctuate considerably, shifting locations of the edges of low oxygen zones. Trawl data showed higher catch rates in zones exhibiting normal oxygen levels that were bordered by low oxygen zones. 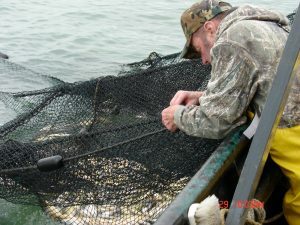 The commercial trap nets were found to have the highest catch rates (18.1 kg/net · night) in areas that displayed low oxygen levels 30 – 50% of the time compared to areas of normal oxygen (8.2 kg/net · night) and areas of low oxygen (0.4 kg/net · night). 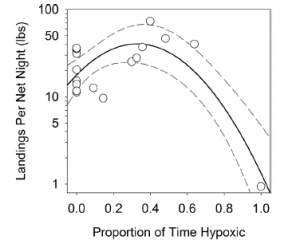 Highest landings in commercial traps were found in zones that were hypoxic (low oxygen) about 30-50% of the time. Reproduced from Kraus et al. (2015). The trawl data and commercial trap net data suggest that fish have a higher catchability around low oxygen zones. These findings have important implications for the management of fish populations in Lake Erie. Models used to estimate fish abundance rely upon the assumption that catchability is constant across regions and that catch is related to fish abundance (e.g. as fish abundance decreases so will catch rates). However, as this study illustrates, catch rates may increase near low oxygen zones. This may lead to inflated fish abundance estimates putting the population at potential risk of overfishing and fishery collapse. 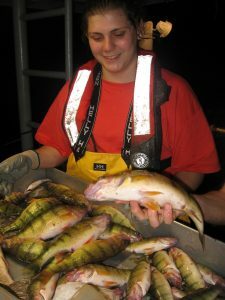 The findings have been well received by the scientific community and have been of practical significance, Kraus recently commented that “Lake Erie fishery managers were quite interested in the findings, and are in the process of using this information to recommend improvements to recruitment surveys”. Baker, D.B., R. Confessor, D.E. Ewing, L.T. Johnson, J.W. Kramer, B.J. Merryfield. 2014. Phosphorus loading to Lake Erie from the Maumee, Sandusky and Cuyahoga rivers: The importance of bioavailability. Journal of Great Lakes Research, 40(3): 502-517. Kraus, R.T., C.T. Knight, T.M. Farmer, A.M. Gorman, P.D. Collingsworth, G.J. Warren, P.M. Kocovsky, and J.D. Conroy. 2015. Dynamic hypoxic zones in Lake Erie compress fish habitat, altering vulnerability to fishing gears. Canadian Journal of Fisheries and Aquatic Sciences, 72(6): 797-806. Next story ‘Cloud’ technology for fish?